Les PiÃ©gonnaises - 2 comfortable, spacious, tastefully decorated gypsy caravans - in Les Baronnies ProvenÃ§ales Regional Nature park, between Nyons and Vaison-la-Romaine, near the Vaucluse department. This charming accommodation is sure to appeal to the child in each of us. Cosy accommodation for just one night or a longer holiday. Many lovely hiking/riding trails, weekly ProvenÃ§al markets, festivals, etc. Fancy staying somewhere unusual? 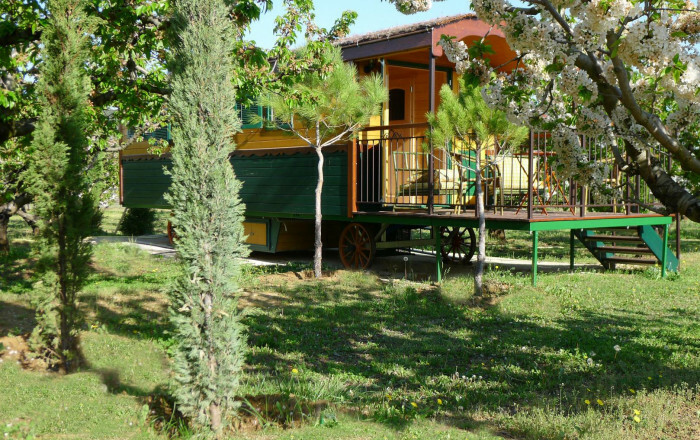 Try our comfortable and original gypsy caravans on 2 hectare property, planted with trees & flowers, with wide panoramic views. Relax in the privacy of this haven of peace set amidst vineyards, olive groves and cherry orchards. Steps up to: kitchen area, sofa, table, chairs, queen-size bed, shower room/WC. Lovely terrace (9 sq.m.). Leisure facilities on-site: heated swimming pool (15x7m), tennis court, golf (6 holes, putting green), table football, billiards, giant chess game, boules pitch. Summer kitchen, 2 sets of garden furniture in shady setting.